and oh how I have, and still am, loving it. So to celebrate I am having a give-away and the winners will be decided by Mr Random Org on the 29th January. I will have three winners and prizes. 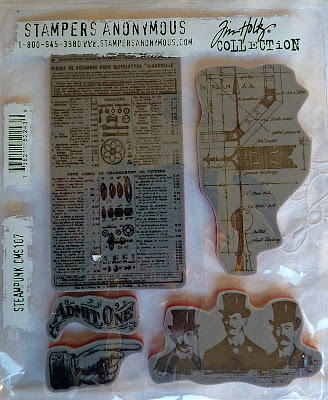 A brand new set of T!m's stamps for my current followers only up to number 284. This is a thank you for being part of this incredible journey and giving me support and love. 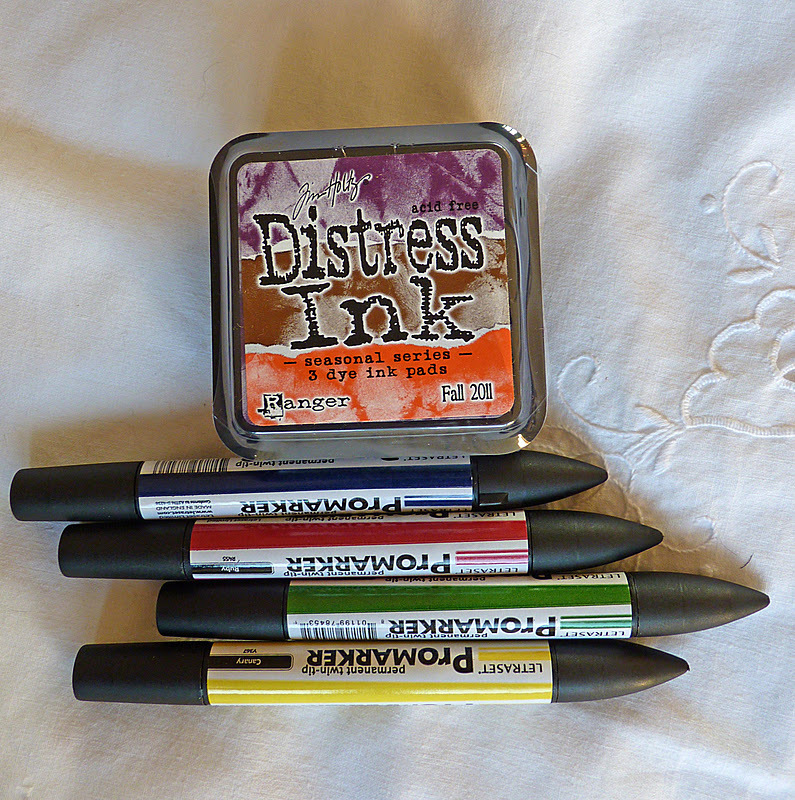 The new distress inks brought out by Ranger for Christmas - but the colours are just gorgeous and 4 Promarkers. This is for any follower old and new. A new set of texture fades - Bingo and Collage, plus two of T!m's stamps that somehow are extra to requirements - again they are brand new. This is also for any follower. I am very near 300 followers and if I reach that amount before the 29th January I will add another prize. All I ask is that you leave me a comment and tell me you have put the picture below on your sidebar. Thanks. I feel so blessed that you are part of this amazing journey with me. When you leave a comment make sure I have a link to you so I can pop over to see you too. Thank you and have fun with creating and making beautiful art. Gosh you are so generous! fabulous blog candy. Picture on my side bar. Wow Brenda - how time flies! Congratulations on your up-coming blogaversary, and thank you for offering such fab. candy! I will pop the details in my sidebar NOW!! A fabulously generous Giveaway from youself. Thanks for the opportunity to take part. Here's to many more years of happy times Blogging. Hi Brenda...congrats on your 2nd blogaversary...always enjoying your journey...and what a fab candy...posting you on my sidebar! Wow, congratulations on 2 years of blogging Brenda...it really is an honour to be part of your journey and to learn from you. I am posting your giveaway on my sidebar. Have you gone back yet to revisit your start? Hi Brenda, congrats on your two years of blogging...I am so happy I found your blog; the giveaway is on my sidebar, and what a wonderful giveaway it is....Here's to 300 followers and many more years of posting.. Cheers ! Beautiful candy, I wouldn'r mind winning one of these! I'm sure you will reach teh 300! and I put it in my sidebar! Very sweet, Brenda, and congratulations! My internet is painfully slow this morning, but I'm going to try and get your pic and link up right now! What wonderful prizes you have to give! I have been honored to be one of your followers for quite some time now and I am delighted to post the giveaway on my sidebar!!! Many congratulations - two years have flown so quickly. I love looking at your projects and reading how they are put together. Pic going on my blog now. Happy Blog Anniversary, dear Brenda! I am so happy that I have met you...and that you share your beautiful art and self with all of us! I hope you have a Happy New Year and that 2012 is full of many blessings! P.S. Forgot to say I've put your photo on my side bar. Funny isn't how easy it is get hooked on this blogging lark? LOL. What a fabulous giveaway this is Brenda - thank you for being so generous. Off to put the link on my blog. Happy 2nd Blogaversary, Brenda. I feel priveledged to have shared at least some of that time with you. Time does fly doesn't it, I'm coming up to my third year and I agree it's an amazing place to be. Here's to your next year. I wish you a great one. Your candy is amazing. I've added a link on my sidebar. Hi Brenda wow, congrats on two years !! It has been a pleasure to visit and am always so inspired by your beautiful art . I have posted your candy on my blog. Congratulations on blogging for two years and all your great work!!! I love your work, really! Have a nice day and lots of good work!! Happy Blogaversary to you and Happy New Year. Thank you for the chance of your wonderful candy. I have put a link on my sidebar. I'm drooling at this awesome candy!! Happy Blogoversary! Wishing you many many more! Congratulations and Happy Anniversary, Brenda! There are a few of us that started around the same time! I am so glad to have had the honor of getting to know you in the blog world and so can't wait for August!! Big Hugs and you are top on my sidebar!! Fab Candy Brenda, so lovely stuff you are really generous crafter!!!! So I thought I'd join in the fun, got your candy on my sidebar! ****Congrats**** on your 2nd Blogaverary chum time does fly by so quickly, you have given so much inspiration to all with your beautiful creations these past 2 yrs and ((((Big hugs)))) for offering this amazing Candy!!! I have popped you pic with link and details on my sidebar. have a super weekend chum. Congrats on 2 years of blogging Brenda,thank you for the opportunity of winning some fantastic candy.Have put picture on my sidebar. Way to go Brenda this is a fabulous blog candy you are going to make somebody very happy. Congrats on two years of blogging!! Isn't blogging fun??!! I get so much enjoyment from visiting blogs and seeing so much creativity. Super sweet candy too. Love TH!! PS: put you on my candy bar! WOW, lovely blog candy give away, \i'm a new follower and new to blogging. Happy Blogiversary, fab candy thanks for giving us the chance to win, have posted your picture and link in my sidebar. Congrats on your second year!! I am new to you, but am glad I found you as I love using the distressed TH goodies...and glad to have found a blog I can use for inspiration for that....now have to look at your blog hop, looks like lots of wonderful creations...I have posted you on my sidebar at my NelliesNest blog...thanks!! WOW what a fabulous blog ... congrats on your 2 year anniversary! I am now a follower and have posted your give-away on my sidebar! All the best in 2012! i just found your blog.. and i gonna follow you....and i love a chance to win your give away. thanks for visiting my blog Brenda. You have asuch a nice blog with beautiful creations. Oh my gosh, Brenda, this is a fabulous giveaway! I want to put it on my sidebar, but for the last few days, Blogger won't let me "save" a button or move them on my sidebar--Did I mention I am panicked? Your giveaway is amazing--just like you! Wow, 2 years of blogging - so how come I only found you today? Very remiss on my part. Congratulations on your achievement and thanks for the chance to win you blog candy - very generous. Will add link to my sidebar and come back for a longer snoop at older posts. What a wonderful giveaway! Please count me in and congratulations on two years blogging!! Do pop over and see my giveaway as well. fabulous blog candy. Picture on my side bar. Thank for the chance to win! Isn't it something - this blogland. I just started blogging in August. It's just amazing, the artistic people I've come to know, from all over the world! I will join as a follower (and remain a follower even after the drawing is over) and show your blog candy in my sidebar. That is how I found you - through WOYWW hosted by Julia Dunnit. Congratulations for hitting such great milestones!! Big Congratulations on your 2nd Blogaversary Brenda!!! Sorry that I have not been over to visit more often - I am not a good blogger lately!! Your creations are always awesome!! and they really are 'works of art' - all so beautiful. Your candy is gorgeous! I have linked you in my sidebar. Well Brenda, congratulations my friend, thats a huge achievement. I hope i can help with the numbers by adding your candy to Dezinaworld. I would be so so thrilled if i was lucky enough to win something, they are gorgeous and generous too. Congrats on your Blogaversary... What a wonderful blog you have here. I would love to have a chance to win this sweet candy. I've linked your candy on my sidebar. Thank you. Have a wonderful 2012. Happy Blogaversary!!! I found you via Terry so glad I did and now your newest follower! I'll post your giveaway on my sidebar. Heres to many more years of blogging! I have only just discovered your blog so I don't qualify for the candy, but I love your work and will come back again. Happy blogging! HI Brenda, what a fantastic candy! I haven't been visiting anyone much lately as I've had the flu but I'm now going to add this to my sidebar! Congratulations on the 2 year Blogaversary! This is fab candy Brenda. Will 'pop' you on my sidebar. congrats with yr blog anivarsary! And what a great candy you have, love to take a chance for it! I have put a picture on my blog! Wow, I am completely new on your blog and I think your work is fabulous! Love all your techniques and projects especially the card that you poured the wax onto and then stamped. Congratulations on your 2year blogaversary. Thanks for a chance at winning some fab prizes and I will be back to check it all out more often. Hi Brenda what a fabulous selection of goodies you are offering for your followers, I have put a picture in my sidebar. Selamat ya sudah 2 tahun di dunia blog.. Happy 2nd Blogaversary! You have a great blog. Thanks for the opportunity to win your candy. I would love to be entered in your drawing and I am your newest follower. Thanks for the opportunity, and please stop by my blog as I just posted a giveaway too. Congratulations Brenda on your seconf blogaversary..! You have got a b'ful blog.. would love to follow you..
Would love if you visit me too! Hi! I just found you, and in a very round about way. Doing a blog hop, then went to one blog and she had your freebee badge that I happened to click on. So glad I did. You have some great freebees. Thank you. Glad to be a follower and will try to get your pic up. Congrats on the 300 followers! My blog is newer, so I have a ways to go. I am so excited to have found your blog! I am just burned out on my "style," and am looking to go in a new direction. I've just spent the last hour looking at your gorgeous creations, and feel like I've found what I'm looking for! I've posted a pic of your candy on my blog at: http://paperluvver.blogspot.com/, and want to thank you for the chance to win your lovely candy. But more, for the chance to be INSPIRED! Thank you so much for that! Dear Brenda- you are incredibly generous with your giveaways to say nothing of your talent- You are well over your 300 goal mark as I make #336 ! Congratulations on two years blogging! 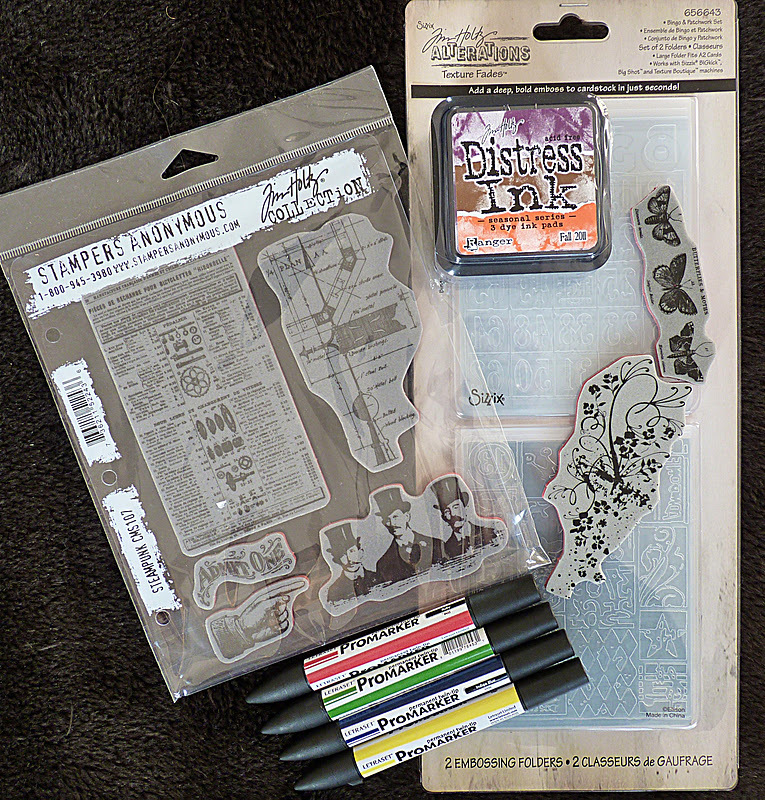 I just came over from Cindy Adkins' Whimsical Musings and didn't even know you were having a giveaway! I'm a new follower! Going to explore more of your blog now! how generous of you to have such a great giveaway. Congratulations on yr 2 years blogging. I have post the picture of the giveaway on my sidebar. Hi Brenda, Your giveaway is fabulous!!! And congratulations on your anniversary--Woo hoo!!! I hope you're having a wonderful Sunday, my friend. Congrats on your upcoming blogaversary, and thanks for poping by my blog and leaving a comment..